Please Note: If you have a Motorola Phone with Motoblur please download "Moto Home Fix" by Nightshade Labs to choose the home application. interface. This application includes many great features; task bar, start menu, widgets page, and of course the desktop. The task bar includes the main features of your device; the start button, the browser, messaging, dialer, and the launcher. The launcher gives you a list of all installed applications and allows you to pick one to run. The start menu allows you to get quick access to the Market, pictures, music, contacts, email, social networking, and other applications. 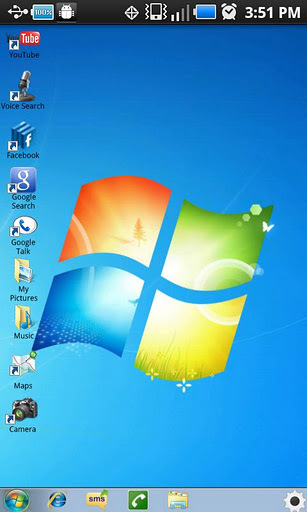 Windows 7 for Android also includes a great widgets feature. There is an entire window dedicated to widgets. You are no longer limited to the amount of widgets you can have and now you can get even quicker access to your notifications. The desktop of course include a few shortcuts to other applications. Check out the screen shots and the video for a demo! Fixed the issue with some buttons force closing.